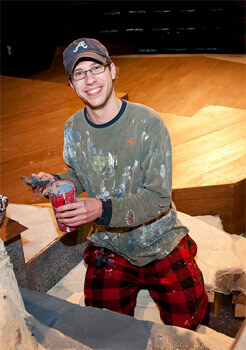 A student paints the set for Summer and Smoke. The Theatre Department’s production of Summer and Smoke by Tennessee Williams opens April 14 in the Dillard Fine Arts Center. One of Williams’ most highly regarded works, this play provides a glimpse into the lives and souls of the inhabitants of Glorious Hill, Miss., and their quest for honest and intimate human connections. Check out coverage in The News & Advance. Show times are 7:30 p.m. on April 14-16, and 2 p.m. on April 17. Tickets are: $10 adults, $8 seniors (60+), $5 students. Box office (434.544.8380) opens on April 11, or purchase tickets online at www.lynchburgtickets.com.